Every December members of Marigold Guild of Needle Arts gather to celebrate the Christmas season. This year, the same as the past few years, we met at Tulips and Thistle Bed and Breakfast, a lovely home and business owned and operated by a former MGNA Guild member just outside the town of Truro, Nova Scotia. It was a magical evening of visiting, laughing, eating, and exchanging gifts. 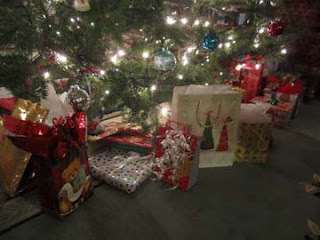 We sat around the Christmas tree – the real McCoy, not an artificial one – and enjoyed the mulled apple cider. There never seemed to be a lack of things to talk about! 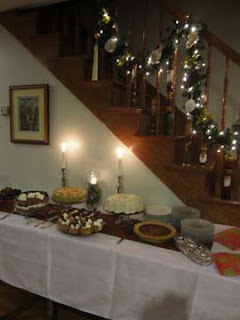 The absolutely decadent spread of desserts – cheesecake and eclairs and torte and trifle – was a true delight and for those who wanted or needed something less sweet, our host provided cheese and grapes and other fresh fruit; we were pampered to the nth degree! 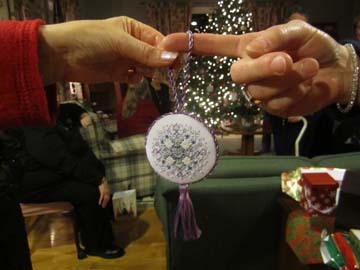 The highlight of the evening, over and above the food, was the gift exchange. Members were invited to bring a stitched gift, valued at approximately $10.00; the gifts were placed under the tree and those who had brought a gift were given a candy cane with a number on it. At the appointed time, a member of our Social Committee drew numbers one at a time out of a box and announced the number; the person with that number picked a gift from under the tree but did not open it until everyone had their gift. At the signal, everyone opened their gift and the oohing and aahing began. 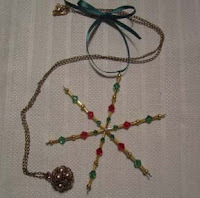 The gift I received was a wonderful beaded snowflake and a hand-beaded necklace. The gift I stitched, a beaded snowflake on blue perforated paper, was received by a member whose favourite colour was blue. 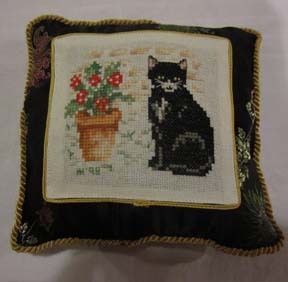 One person spoke about how amazed she was that the gifts that were received exactly suited the person who received it – like the person who received a small pillow with a cross-stitched black and white cat, just like her cat at home. All in all, it was a wonderful evening – a gathering of friends in a warm, friendly atmosphere. hope you enjoy a few photos of the evening that was so special to us, the MGNA members who were able to attend this wonderful evening. Sheila your Guild Christmas celebration sounds an looks like it was truly magical. What more can a person need than good food ,good friends and hand stitched with love gifts. Very nice post and pictures and it sounds and looks like it was a wonderful evening indeed. 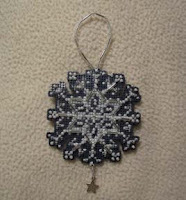 Your beaded snowflake looks lovely. Have a very Merry Christmas. What a wonderful evening it sounds like!